John read music as organ scholar of Hertford College, Oxford before postgraduate studies, firstly at the Guildhall School of Music (repetiteur), and then at The Royal College of Music (conducting). He won a scholarship to study under conductor Diego Masson at the 1996 Dartington International Summer School where he made his opera conducting debut with performances of Rigoletto. Since then, John has worked on the music staff for Icelandic National Opera and Grange Park Opera, and he is currently Musical Director for Swansea City Opera. 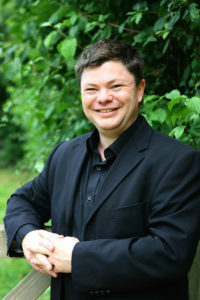 He has conducted over twenty opera productions for companies including Pimlico Opera (The Elixir of Love, The Barber of Seville and Cosi Fan Tutte), London City Opera (Carmen, La Traviata and Madame Butterfly) and Swansea City Opera (La Boheme, Faust, Don Pasquale, The Marriage of Figaro, The Magic Flute and The Daughter of the Regiment). As an orchestral conductor John is currently the Principal Conductor of Redhill Sinfonia having previously held posts with Slough Philharmonia and Southampton Youth Concert Sinfonia. He made his debut with Herts Phil in February 2015 and has worked with many other orchestras including Iceland Symphony Orchestra, Oxford University Orchestra, Oxford Chamber Orchestra, Aylesbury Symphony Orchestra and Colne Philharmonic. John has had a healthy career in Music Theatre and was for two years the Associate Musical Director for the West End production of Les Miserables. Other shows he has conducted include Miss Saigon (UK Tour), Avenue Q (West End) and Damon Albarn’s opera Monkey: Journey to the West (Monkeys’ World at the O2), and he has also played keyboard on a great many others including Jersey Boys, Legally Blonde, Top Hat and The Full Monty. John has also worked on many youth music theatre shows and student productions at home and abroad, and has clocked up almost 6 months ‘inside’ having thrice been Musical Director for Pimlico Opera’s prison projects.